FieldTrip is a library for functional 3D graphics, intended for building static, animated, and interactive 3D geometry, efficient enough for real-time synthesis and display. Our first renderer uses OpenGL, with the usual visual limitations. Since FieldTrip is functional, it is about being rather than doing. One describes what models are, not how to render them. FieldTrip is work-in-progress. It's being released to show what's going on and see who's interested in collaborating on developing it further. Join the FieldTrip mailing list. Visit the Hackage page for library documentation and to download & install. Or install with cabal install FieldTrip. See Installation dependencies below. Report bugs and request features on the tracker. The basic purpose of the core FieldTrip library is to allow a user build 3D geometry, from individual simple shapes to full 3D scenes. The principal types are as follows. 3D geometry. These values can be spatially transformed in space (affinely: scale, rotate, translate) and combined (union). 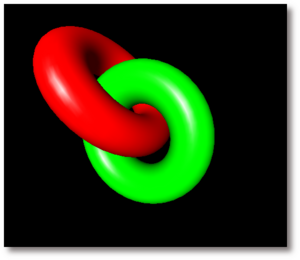 Parametric surfaces, i.e., mappings from 2D to 3D. Normals are constructed automatically and exactly via derivatives, thanks to the vector-space library. These normals are used for shading. For simplicity and composability, surfaces are curved, not faceted. Surface rendering tessellates adaptively, caching tessellations in an efficient, infinite data structure for reuse. The mechanism for choosing tessellation is a very primitive placeholder. FieldTrip provides some basic shapes of surfaces (spheres, torus, cubes, etc) and many functions for manipulating surfaces, colors, etc. 2D geometry. There's a function (flatG) to embed 2D into 3D. something like it for texture mapping. Much design and implementation work to be done. where pivot3X and move3X are simple helper short-hands for 3D transformation. where revolve and circle are defined in Graphics.FieldTrip.ParamSurf, along with other tools for shape generation. The trick to turning this polymorphic torus function into a Geometry3 is to use a derivative tower (from vector-space) for the type parameter s.
FieldTrip contains no support for animation, because we intend it to be used with the Reactive functional reactive programming (FRP) library (and possibly other animation frameworks). By design, FieldTrip is completely orthogonal to any formulation or implementation of FRP. The reactive-fieldtrip project connects Reactive and FieldTrip. Loading package integer ... linking ... done. Ok, modules loaded: FRP.Reactive.FieldTrip.Adapter, Test. Loading package OpenGL-2.2.1.1 ... linking ... done. Loading package syb ... linking ... done. Loading package base-3.0.3.0 ... linking ... done. Loading package reactive-0.9.0 ... linking ... done. Loading package FieldTrip-0.2.2 ... linking ... done. Loading package reactive-glut-0.0.5 ... linking ... done. The torus demo running in GHCi. You'll need the OpenGL and GLUT packages. If you are using synaptics/apt-get, those are called libghc6-opengl-dev and libghc6-glut-dev. If you're using cabal-install, it will take care of the dependencies for you (see "Non-Haskell libraries" below though). Or, if you do have the Haskell packages and C libraries, but accidentally removed the opengl-dev and glut-dev libraries, you can end up with FieldTrip just producing black windows. This page was last modified on 3 July 2009, at 19:45.